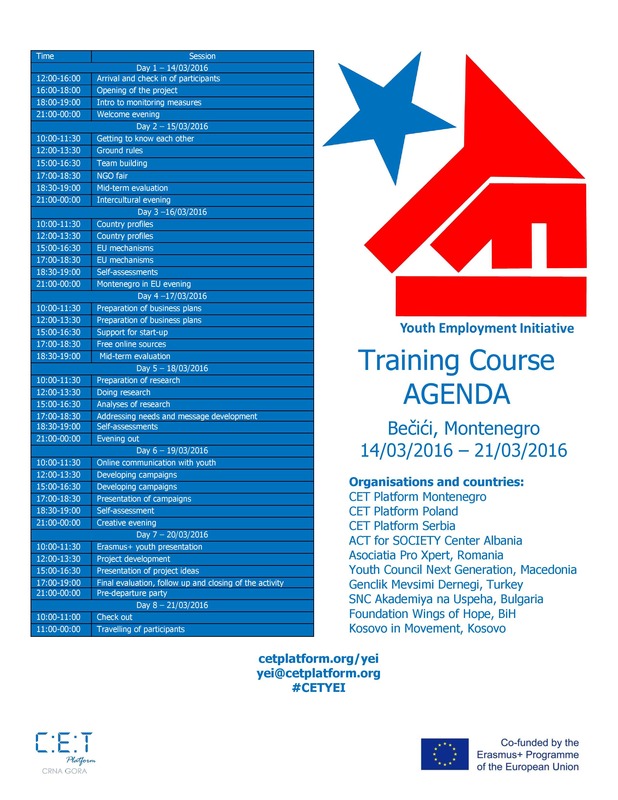 Project “Youth Employment Initiative” will be hosted by CET Platforma Montenegro and will include 30 youth workers and young leaders from 10 European countries in one Training Course that will be hosted in Bečići, Montenegro from 14/03/2016 until 21/03/2016. Participants will come from Montenegro, Poland, Serbia, Albania, Turkey, Bulgaria, Maceodnia, Bosnia and Herzegovina, Kosovo and Romania. Youth unemployment rate in this countries in among highest in Europe, in some cases in the whole world. Find out more about aims and objectives of the project on this link. For more information about travel and other costs please click this link. Online application is on this link. You should have personal account on salto-youth in order to apply for this project. Deadline for applications is 09/02/2016. Selection of participants will be done by each partner organisation from each country. For more information please contact partner organisation from your country.